The pages that follow are to be regarded as merely an attempt to put in permanent form the genealogical material that has fallen into my hands, with the hope that it may be useful to generations following, and possibly may encourage some one of the tribe to prosecute the work until there shall be a complete genealogy of the Hazen Family. A considerable portion of the facts here given was furnished by my father, Rev. Reuben S. Hazen, and has been in my hands for many years. I am indebted to Rev. H. A. Hazen, of Boston, Mass., and H. A. Hazen, Esq., Washington, D. C., for much material, and for correction of that already in my possession. If those to whom a copy of this may be sent will send me such information as may be in their possession. with regard to the present or to past generations of the family, not herein contained, it will be carefully preserved, and possibly used at some future time for the enlargement of the work. 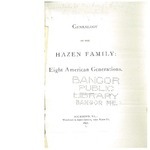 Hazen, James King, "Genealogy of the Hazen family: eight American generations" (1892). Books and Publications. 63.